Background: Alpacas are camelids who evolved in North America. Although the ancestors of the llamas and camels began to diverge, they weren't completely separated until the ancestors of the camel migrated across the Bering Strait land bridge to Asia. Alpacas and llamas migrated to South America and all the remaining camelids in North America died out. Alpacas are closely related to the other "New World" camelids species; Llamas, Vicunas, and Guanacos and still have much in common with their distant "Old World" cousins, the Dromedary (one humped) and Bactrian (two humped) camels. Alpacas are members of the camel family and are one of nature's greatest gifts. With their gentle nature, variety of color and soft luxurious fiber, Alpacas have an irresistible appeal to humans. 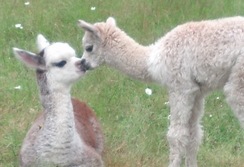 Much smaller than Llamas, weighing about 175 pounds full grown, the Alpacas appear to be very delicate. However, they are rugged, self-sufficient and adaptable to all sorts of conditions. Their natural habitat is the high plains of the Andes Mountains of South America, a place that dishes out some of the harshest extremes of any climate on earth. The summers are hot and dry, with very little forage and the winters are extremely cold with little or no shelter. These animals can endure in the harshest of climates. Breeds: Alpacas come in two distinctly different breeds - Suri and Huacaya. They are similar in every way with the exception of how their fiber grows; Huacayas look like teddy bears with their long soft coat while the Suri has a more silken fiber that grows in long dread-locks. Herd Information: Alpacas are herd animals and are best kept in groups of two or more animals. A lone alpaca can become nervous, restless, and generally unthrifty. The life span of the alpaca is about 20-25 years and gestation is 11.5 months. Females generally reach breeding maturity after about 2 years old and have one cria (baby) per year. How many in my pasture? Alpacas are ruminants and have a complex, 3-compartmented stomach where they regurgitate and rechew their ingested food. Alpacas eat very little, about as much as a large dog and require minimal fencing (more to keep local animals out rather than keep the alpacas in). They eat grass, hay and pelletized feed and rarely eat anything else except an occasional apple. As a rule of thumb, you can keep about 5-10 animals per acre of pasture. However, with additional feed you may be able to increase this number depending on conditions in your area. Why raise alpacas? Alpacas produce one of the world’s finest and most luxurious natural fibers. It is clipped from the animal without causing it injury. Soft as cashmere and warmer, lighter and stronger than wool, it comes in more colors than any other fiber producing animal (approximately 16 different colors) with many variations and blends).This cashmere-like fleece, once reserved for Incan royalty and prized for its incredible ability to be both lightweight and warm when spun into clothing, is now enjoyed by spinners and weavers around the world. These natural colors are highly prized by many in the textile industry because the fiber does not have to be chemically dyed. What are the financial benefits? Alpacas can offer a solid investment and lifestyle. Worldwide their numbers are low and unlike other live commodities, the demand for the fine fleece of the Alpaca has continued to increase. Currently Bolivia and Peru are supplying the world markets in China, Japan and Europe. The Alpaca's gentle and personable traits can be coupled with the financial returns to make a perfect asset for anyone, providing a peaceful lifestyle away from corporate America with financial opportunities like no other investment. Lastly, alpacas provide terrific tax advantages under Section 179 for your farm or ranch.